DP&C® Suite is designed to provide return on investment through enhanced process and asset management, and to increase infrastructure capability that enables profitable growth. DP&C® is a full-service Technology Integrator, Consulting, and Project Management team. Utilizing proven expertise and decades-long experience in supply chain engineering and management, along with advanced technologies, proprietary software and state-of-the-art equipment. DP&C® Suite synchronizes the real-time movement of material, information, and working capital across the entire supply chain. The solutions are designed to provide a healthy return on investment to client while integrating infrastructure capabilities that enable efficient growth. Getting any product from source to client is complex, demanding sophisticated architecture and infrastructure. DP&C® Suite is uniquely positioned to meet the demands of the speed of business in the 21st Century. DP&C® can enhance weak links in the supply chain, implement advanced technology hardware and/or software solutions, integrate business functions, or take the total supply chain process from concept to implementation, DP&C® suite is customizable that return tangible, measurable benefits in process, speed and costs. Respond to market pressures that have been squeezing margins and cash flow by Re-engineer client's supply chain, manufacturing, order fulfillment and customer service processes to demonstrate the value of integrating supply chain and logistics processes into a seamless system supported by 21st century application of affordable, reliable and practical technology. Provides solution to enhance client's return logistics and mobile asset operation by applying customized solution which utilizes GPS technology and proprietary engineering. DP&C® solution provides global, real time visibility regarding the status of mobile assets. it interface the information with the client's existing ERP application to provide management with tools and capabilities necessary to more efficiently allocate and align the utilization of mobile assets with manufacturing and production schedules. Provides development and execution of strategic and tactical supply chain reengineering solution designed to improve management of inventory levels, improve product integrity and reduce operational costs. The customized DP&C® solution involves both analysis and implementation of systems and processes to improve shop floor flow, enhance process and procedures and strengthen documentation process. In addition, DP&C® increases the ability of the client's ERP system to more effectively manage expenses, inventory, product traceability and customer service. DP&C® analyzes the processes utilized by the high-volume manufacturer and distributor of consumer products, assessing all avenues to enhance operations by applying customized strategic and operational solutions that would reduce operating expense, transportation costs, inventory on hand and reduce lead time to the customer. .
• Dynamically links to current manufacturing processes and routing to provide the ability to integrate into current ERP systems. • Integrate critical elements of manufacturing process and other applicable sensor information to increase integrity and validation of the production process. • Provides visibility to all critical activities in the manufacturing process. • Management Dashboard provides custom view of all critical operating parameters to appropriate managers in company. • Provide visibility of all historical and future utilization of plant-wide capacity. 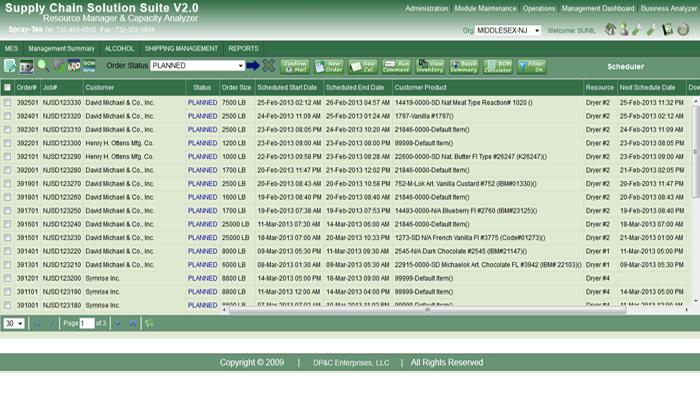 • View details about all critical parameters impacting business like purchase, sales, receipts. • Provides custom and standard reports to provide information about historical data in a comprehensive yet concise manner. • Multi-level point of sale order entry module [ERP interface or manual entry] designed to mitigate order entry effort. • Real-time manufacturing status for scheduling and management staff to compare planned utilization against available capacity. 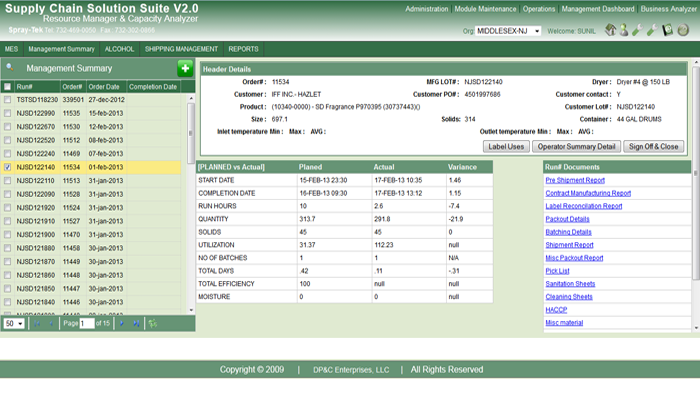 • Inventory System Integration Validates inventory availability prior to release of manufacturing order to shop floor. • User management is done by Define roles via permissions to employees to allow various levels of access within DP&C® suites to different modules. • Fully configurable as administrator control over all module functionality. • Provides the functionality to take critical element readings like weight capture, flow rate and temperature from real time devices like IND560. • Provides an fastest, efficient and error free way of packaging of customer's order. • Provides the functionality to generate new batches according to the availability and capacity of resources to make an order fulfilled. • Use of IND560 device to take readings make it fast and accurate process. • Provides the functionality to make customized calendar like production calendar,accounting calendar as well as HR calendar. • Provides managerial facility of resources as per our need for a particular day. • Enhance examining and viewing capability of resources which are available on particular day. • Also provide the functionality of adding exception if variation occur from the normal schedule. • Enhance managerial and accessing facility by giving information about what work need to be done on which date as per day,month and year. • Inventory management by providing standalone inventory system as well as integration to ERP application. Here all sales order are listed which are scheduled according to their status and they are further processed. 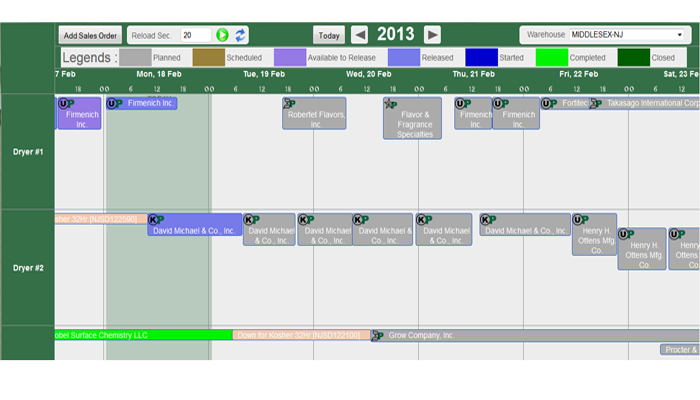 Schedule order calendar manage sales order according to dates and differenitate by color of their status and customers. 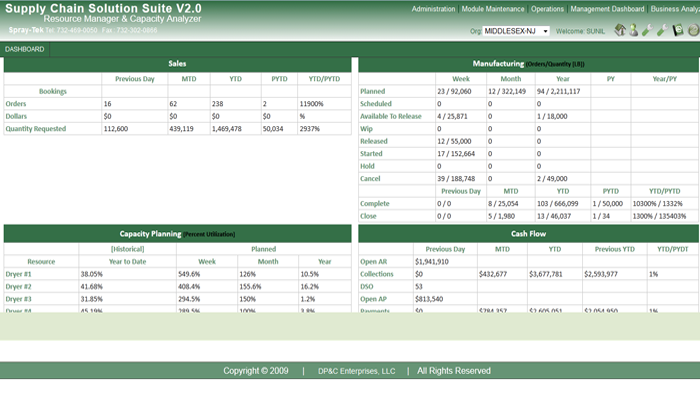 Dashboard shows data of cashflow, sales, manufacturing and capacity planning in a grid view periodically. 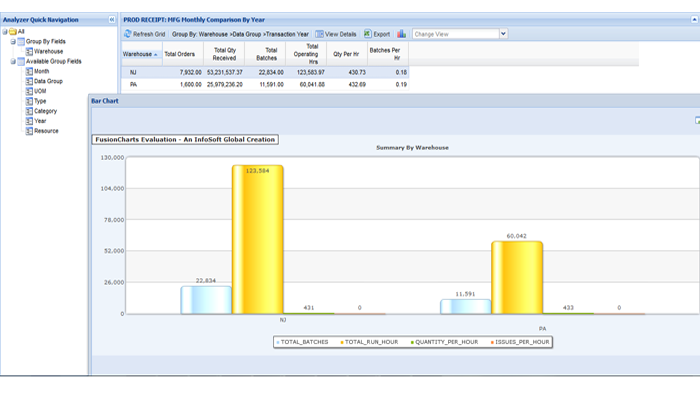 Analyzer screen shows the graphical form of the data according to the various field. 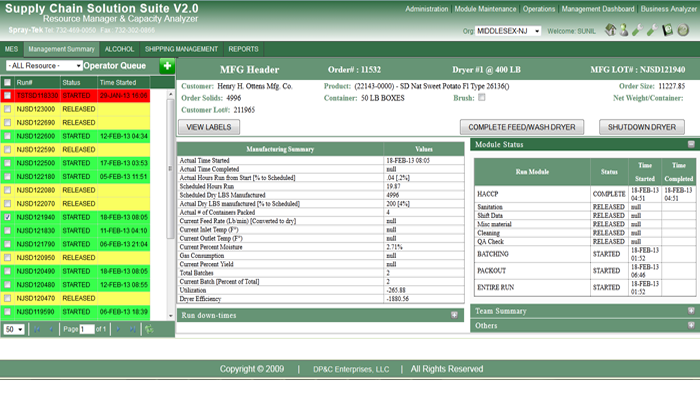 Management Summary screen shows the details of the orders like thier actual value , planned value and theirs variance and also generate multiple pdf reports. Operator Summary screen shows the order according to status for multiple dryers and can be updated the dryer status with varification. 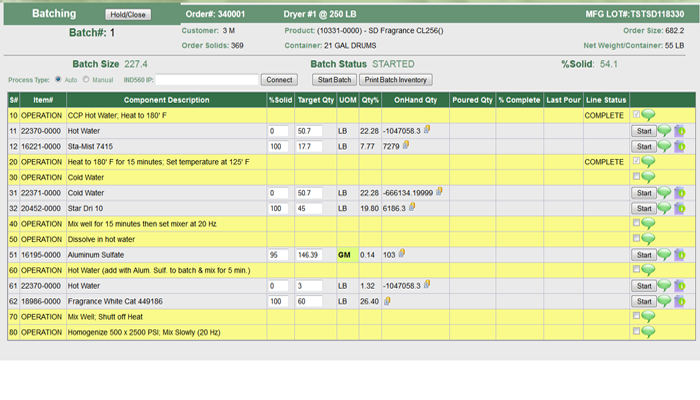 Batching screen manages the batches for items of any order with showing its details. Batching screen manages the batches for items of any order ..